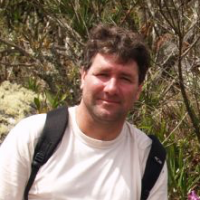 Alek ZaslawskiOur gust speaker this month is Alek Zaslawski of AWZ Orchids in Brazil. The topic of his presentation is the species Cattleya violacea and he will show plants in their natural habitat as well as flowers with different color forms. His talk will also include many cultivation tips. Alek was born and raised in the state of Espirito Santo, in Southeastern Brazil. His father, Wladyslaw, grew orchids as a hobby, and Alek was always surrounded by orchids at his parents’ home. His father enjoyed taking trips to see orchids in the wild and would take Alek with him. Alek became a mechanical engineer and never expected to work with orchids, however, orchids would always catch his attention. He admired their beauty and the way they grew in nature. When his father retired, Alek quit his job to start an orchid business with him and in 1994 they opened AWZ Orchids. Alek and his father were aware that orchids were quickly disappearing from the wild and their original idea was to reproduce plants in their nursery to help reduce the pressure on native populations. They also noticed that most of the plants that had been collected in the past had simply disappeared from collections. Typically, they had been killed or sold to foreign growers. Over the years, AWZ has tried to bring back some of the best varieties found within many species, especially those belonging to the Cattleya alliance. AWZ Orchids currently has around 20,000 plants in their collection, primarily species from Brazil as well as other regions of South America. AWZ cultivates their orchids in two nurseries, totaling 56,000 square feet of greenhouse space. One nursery, located in Domingos Martins, at an altitude of 3,600 feet, is used to grow cooler-growing plants, and the other, located in Viana, at an altitude of 990 feet, is used for warm-growing plants. Their plants are sold throughout Brazil and are also shipped abroad.